beerbistro & Eastbound Brewing Co. Present a 5 Course Dinner with Pairings! 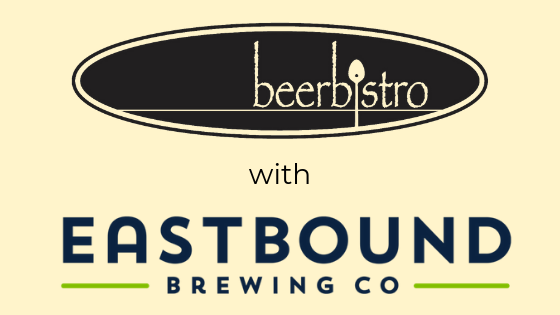 Join us for an exciting evening featuring a collaboration with our very own Chef Nathan Campbell and Eastbound Brewing Co.'s Chef Tara Lee along with Eastbound Brewing Co.'s brewmaster, Dave Lee! This is beer cuisine at it's finest, with beer as a cooking component as well as special pairings to accompany each carefully crafted dish. Eastbound’s craft brews will be featured in every dish! Sit back and listen to the experts talk about what inspired their choices for courses, how the flavours in their food is attributed to the beers they prepared with, and why cooking with beer is so special to them. This collaboration has been long awaited and you won't want to miss out on this intimate evening with such a passionate team. Event will be held on February 19th from 7-10pm at beerbistro. If you have allergies or dietary restrictions, please contact beth@beerbistro.com. Ticket Price includes 5 course meal + 5 beer pairings led by beerbistro and Eastbound Brewing Co. Older PostFeeling 'Appy As We Are? "All in house, all prepared with passion and it tasted awesome. I had always thought of this place just for beer (I work close by) but now I realize the food is really great!" "I love this place. They have an amazing beer selection. The food is good too. The frites are amazing." "I was impressed by the beer knowledge of the bartender. The food was good and the staff friendly. Overall a great experience."